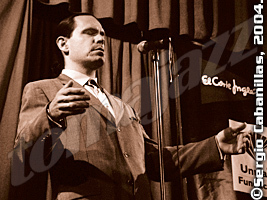 Singer and songwriter Kurt Elling has become a cultural icon in the U.S.A. The release of his latest record Nightmoves has taken him on a world tour which included a date in Madrid (July 13th 2007). Just a few hours before the concert Arturo Mora and Pablo Sanz had the chance to interview him in a relaxed environment. His album, jazz, artistry and other topics are presented here as discussed by Elling. PABLO SANZ: After a successful career in Blue Note, why did you switch to the Concord label? 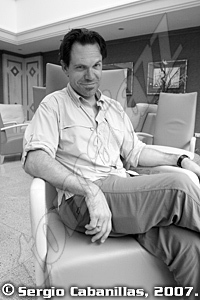 KURT ELLING: Well, I hope it will continue to be successful. They signed me for six records at Blue Note, and I made six, and at the same time I’m turning 40 this year, my wife and I had our first child, we changed apartments, so… many changes. And I wanted to see who else was interested and what other partnerships I could make. I felt that I could do more, and also just ‘cause I’m curious about life. And so far, so good [laughs]. Everything’s gonna be OK, galactic! [laughs]. ARTURO MORA: Is it because of all that that you called your new CD Nightmoves, because all of this change happening? KURT ELLING: Yeah, it does fit into that. I called the record Nightmoves because in my mind the record tells us a sort of cinema of the mind. You can put it on if you want to and follow the character through overnight. When the night comes it’s a very special feeling, the sun is horizontal and it’s that beautiful magic hour and it always feels to me that anything is possible. In the daytime is like: “I gotta do these things”, responsibilities, phone calls, whatever, but when the sun starts to go down, now life can happen. Many moves, many possibilities, love and betrayal and adventure and maybe the truth comes out. KURT ELLING: And, of course, jazz. Jazz is tough in the daytime [laughs]. 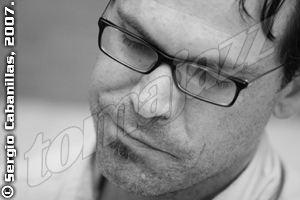 PABLO SANZ: Cassandra Wilson told me once that instead of choosing songs, songs chose her. Which is your working method, how and why do you choose the songs? KURT ELLING: Every record comes after another period of time, of touring with the band, so let’s say that there’s two years between a record. Over two years you’re playing the record you’ve just put out and you say: “hey, I’ve got these three other ideas for a record”. Or you sit down and you have an idea for a song. So over two years there are too small intuitive decisions. You follow your ideas, you follow what’s pressing you here, and over one year or two years you’ve made many decisions: this doesn’t work, or you need to change this, or this makes the audience really happy in this way. So any idea that I have, and as much as I can put it down on paper we can start to play it right away and find out if it fits or not. So a record, in its best way, is the culmination of many small decisions. It’s one big decision that comes of many small, small decisions. ARTURO MORA: What do you look for in a solo to work on it in vocalese? KURT ELLING: First I just have to like it, fall in love with the piece of music, and sometimes I love a piece of music for many years before I even think of it to write a lyric, because I don’t wanna only listen to music with more work in mind. I want to just be a fan too. But every once in a while I go: “I like this, I wonder if it could work”, and then I have to listen to see if it is possible, because, let’s say, maybe the musician plays something that’s very, very fast, or that isn’t notes, that’s just sound. Then I have to say: “well, can I sing this? If I sing it, will it just sound ridiculous? Is it impossible? Is the range too broad?”, there are some technical decisions to figure out. If it works I sit down and try to learn the solo, and while I’m learning it I try to make a scratch lyric, just to get ideas going. Or, sometimes, I’ll be listening to a solo and there will just be a lyric. Sometimes the way the musician plays will be so lyrical, as if he were singing, not playing the trumpet or the saxophone. That’s the best way, because then I feel that I’m just translating from another language. I pretend it. And then it’s very hard work, like any other writing. PABLO SANZ: Your jazz audiences notice the differences between younger singers like Jamie Cullum or Michael Bublé and you. Do you feel you’re more a jazz singer than these guys? KURT ELLING: Well, I am different. I think Jamie’s great, I think he’s a lot of fun, and I think he’s really hip and new. I don’t know Michael Bublé as well, I only know some big band stuff, but I get the feeling that Michael Bublé doesn’t really care as much about being a jazz person. No judgement but, I mean, I’m an artist, I’m a jazz artist, and in many ways it makes my relationship with a new audience much more difficult in any country, because what I do is not as straightforward, is not as clear the very first time, and the references I make sometimes are a little obscure, and the music that we make is more complicated. That means I have to be very conscious to try to make an audience happy early. Make them happy right away, and give them something that they will say: “oh, I’m so glad we came”, and then when I make the difficult thing they say: “he’s heavy, what do you think about this?” [laughs]. In may ways I wish I could be breezy: no cares, you’re eighteen, … but I’ve never really been eighteen [laughs], I’ve always been an old man. So do I feel different? Yes, but I believe in what I do and I believe that enough of the people in the world want to have some challenge, and want to have good conversation after a concert, and then they have some creation as well. ARTURO MORA: You sing, you write, you’ve worked for the Steppenwolf Theater in Chicago, you’ve also worked with your wife Jennifer, who’s a dancer. Do you think all art forms are, in some way, related? KURT ELLING: Oh yeah, sure. I don’t know all the ways, but my intuition tells me they come from the same kind of feelings among the people who end up really becoming artists. There’s a incomplete feeling that you have when you can’t do your work, and I know that there’s a lot of awkward struggle and pain that is common to all people, but has a unique challenge to people who are artists. Yeah, I believe that what artists are really doing, they are reaching out for the future, they are holding up an example of something that’s nouveau, something that’s important to society. And I’ll tell you why: because when I go to hear Keith Jarrett or Wayne Shorter, or when I go to the ballet – the ballet is so beautiful – it reminds you what’s possible for human beings, and it’s very moving, and it lets you forget terror and disappointment and pain, and it lets you focus only on something that is pure in intention and beautiful in execution, and in that way makes everyone who’s in the audience paying attention more noble. It’s the evolution of the species, it’s the maintenance of humanity in many ways. KURT ELLING: The one who went away because of that? I was very proud of you when this happened. That’s not easy. There’s something in human beings that tries to destroy everything. Original Sin is a legitimate category of our experience, and it describes something real, it describes a will that we have to hurt each other, and to leave myself up by pushing you down. This gets back to your question: this is why art is important. That’s why your intention’s got to be so powerful every time you perform. I heard the story about Wayne [Shorter] in the back seat of a car going for a soundcheck or something and he says to his road manager: “how’s it going?” and he goes: “it’s terrible, this thing didn’t work out, luggage got lost, there’s a long, long list of things”, and Wayne says: “what are you gonna do tonight?”, and the manager says: “I don’t know, I don’t know, I just feel so bad. What are you gonna do tonight?”, and Wayne says: “I’m going to manifest my enlightenment through music”. See? That’s what I mean. Long day, airport, my wife and my little baby are thousands of miles away, but here are people and I have my work, and I’m here to aspire to this experience that I have with other artists, that’s what I’m here to do. That’s what makes me feel different from someone who’s eighteen. 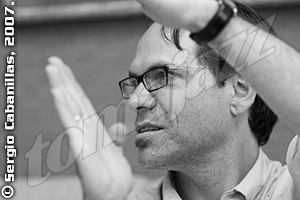 PABLO SANZ: You’ve kept your collaborators for a long time (Laurence Hobgood, Rob Amster, Willie Jones III). What can you tell us about them? ARTURO MORA: In your new record there’s a song called “The Waking”, a duo between you and bassist Robert Amster. The lyrics are a poem by Theodore Ruthke. How did the music come out? KURT ELLING: I’ve done this many times, to take a piece of poetry and make it work with a piece of music. Over the chord changes I will freely make a new melody with this piece of poetry, and in some cases this is developed into kind of set pieces, because they work so well and it gives the audience something that’s new from me, even on a piece of music of mine that they know very well. In the case of “The Waking” that you’re referring to I just asked Rob to make a motif and we just started the same way without any idea of how it would work out and we played it in many gigs. Then when we went into the studio, it was not in the list for the record, but in the very first day, when we were going to do the first cut, there was something so wrong with the piano that we couldn’t make the record with that piano, so the five people got on the phones and while they’re doing this, as I don’t like to waste any time, I said Rob: “Let’s do this, and maybe something will come out of it, and at least we’ll be busy”. ARTURO MORA: The content of the lyrics in your music is very important. May this be a problem with non-English speaking audiences? Have you found foreign audiences less receptive because they didn’t know the lyrics? KURT ELLING: Well, I’m very conscious of this, as I said I need to make people happy, and I know that what I do is difficult even for people who speak English, and I don’t have a better answer other than: I guess people just listen to it as just music. You know, when I listen to a beautiful fado singer I don’t know what she’s singing about, I just feel like: “listen to that, that’s incredible”, and I feel the passion, I feel the music. You don’t always have to know everything that’s happening, you don’t have to know all the layers because maybe what she’s singing has all that history, and she’s referring to other singers and… But I don’t know any of that. So the lyric is not necessary for every single audience. It’s necessary for me, because I’m the writer. But, well, it’s an imperfect world. [laughs] Or maybe it’s better they don’t know what I’m singing about specifically, maybe I’m not a good enough writer [laughs]. ARTURO MORA: In your project Spirituality, Poetry & Jazz you said: “Lyric writing is a form of poetry. It must rhyme and follow a coherent form. In the sub-category of Jazz and vocalese writing, that means the composition of words to fit the melodic contours and rhythms of a modern musical art form that is exhaustingly challenging.” Do you think in some way lyric writing is underrated? 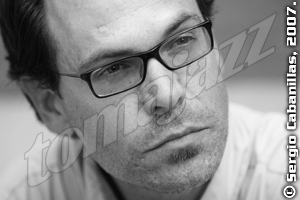 KURT ELLING: I don’t know, I mean: does anybody even care? Does anybody even care enough about poetry? You care, obviously, but I mean people. Do people even pay attention to poetry enough to say: “this is more important than the other”? I don’t know. KURT ELLING: For me, I don’t have the training and the understanding enough for poetry as it stands alone to take part in that art form in a deep way. But over here I understand music, and I know what sounds right for a language most of the time, and I like it and it feels like it’s something I should do, because there’s almost nobody else interested, and the people who came before me made an important thing happen, they made a new form of art, and they didn’t go to art school, Eddie Jefferson didn’t go to poetry school, and Jon Hendricks didn’t go to poetry school, and Annie Ross, and their stuff sounds killing. I’m very critical of my work and I try to improve all the time and when I look back at some pieces that I’ve written sometimes I say: “man, I wish I had written that section better”. Like you do when you try to get better. But at the same time here I am, and some of the times it’s pretty good, so I just keep trying. ARTURO MORA: Three years ago you performed live in Madrid the song “The Sleepers”. In Nightmoves you’ve recorded that song with a string quartet. How has the piece evolved through the years? KURT ELLING: We don’t perform it every night. I get bored easily, so the set changes a lot over time, and there are certain specific things that have lasted much longer than others. “The Sleepers” started from a Fred Hersch work, and then it became something we did in another key with strings. But I don’t know, I don’t listen to the record very much, I don’t like to go: “Yeah, I sound great!” [laughs]. After we make the record, and I do my best to make sure it sounds as good as I can make it, I tend not to listen to it very much, so I’ll have to play it for you tonight and you’ll tell what does change. ARTURO MORA: I’ll tell you [laughs]. How did the collaboration with Christian McBride happen? KURT ELLING: Christian and I had met a bunch of times, but we’d only got to play together twice or three times. We just called him to find that he was gonna be in town, and then we invited him to make an arrangement, and he’s super beautiful, a really loving guy who’s a complete top master of music. He was beautiful enough to bring his thing into our world. It was very easy, I just called him up, played a little bit and everything came together. With most jazz people it’s not that big of a deal, if you meet them a couple of times and you respect each other’s work and … The jazz world is not so big, it’s not like calling a David Bowie or something. There’s a couple of guys I couldn’t call up: Wayne [Shorter], Keith [Jarrett]. I could sort of call Herbie [Hancock], but I’d really had to have something to invite him on. There’s sort of like ten guys, but everybody else is like you can just call them up and say: “Hi, it’s Kurt”. ARTURO MORA: How do you work with Laurence Hobgood? When you’re writing a song or an arrangement, who does what? KURT ELLING: All the time it’s different. He’ll bring to me something that’s a big sketch, and I’ll come to his house, and we’ll play and he’ll say: “what do you think?”, and I’ll say: “well, I don’t understand that section” or “this is really cool” or “I would like to hear this section like this”, and we’ll work on it together until we find something out, and we’ll probably do one session, and then after we have it all up he’ll go to work and I’ll go to work on my thing and sometimes I’ll bring to him something that’s for me almost ready to go, but I’ll know his, you know, brain, so: “how can we fix this up?” And he’ll go: “wow, that is good, what about if we did this?”. So it’s like a conversation that either one of us can start. We can go from many places. ARTURO MORA: Upcoming projects, musical or whatever? 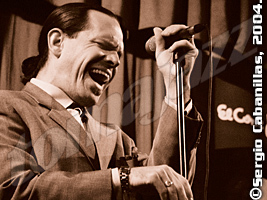 KURT ELLING: The biggest thing I have is that I have a lot of touring, and I’m kind of in the middle of what’s happening, I’ve got a lot of business to take care of. The touring, I’ve got a lot of special projects, I’ve got a Nancy Wilson special concert to make, we’re doing big orchestra things in Australia in 2008 and I need to commission big charge for it and figure out which tunes, … I’m always writing, so that’s always happening. Overtime I’m working on a screenplay, but it’s taking a long time, ‘cause I don’t know what I’m doing, so I’m learning while I go. The baby’s a big deal, I really wanna make sure I do that right. I used to have like ten things, but now I want to be a good father, and it’s very, very difficult to be on the road this much and to do that at the same time. So when I’m home I’m not going to be kicking around and say: “I’m going to work on my screenplay today”, I’m definitely going to be in with my baby and make sure that she’s cool and give my wife a break and try to be a man. It’s a big deal. It’s the number one project right now.